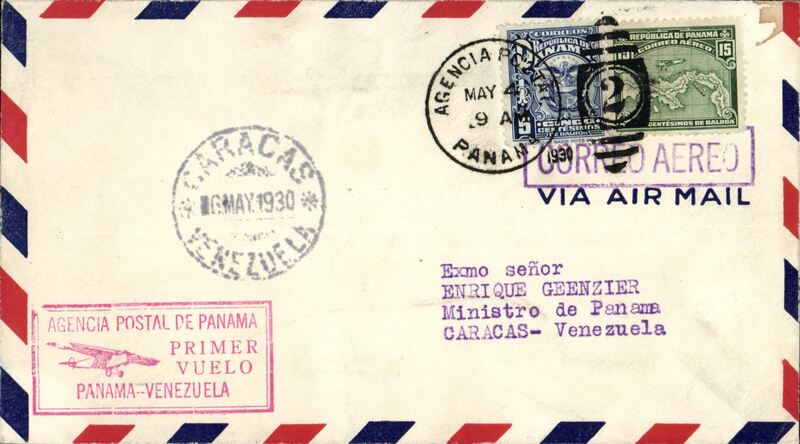 Cover flown Panama to Canal Zone, franked FDI Lindbergh 2c and 5c blue, issued to honour Lindbergh's arrival in Panama, both stamps canc special red commem cachet. 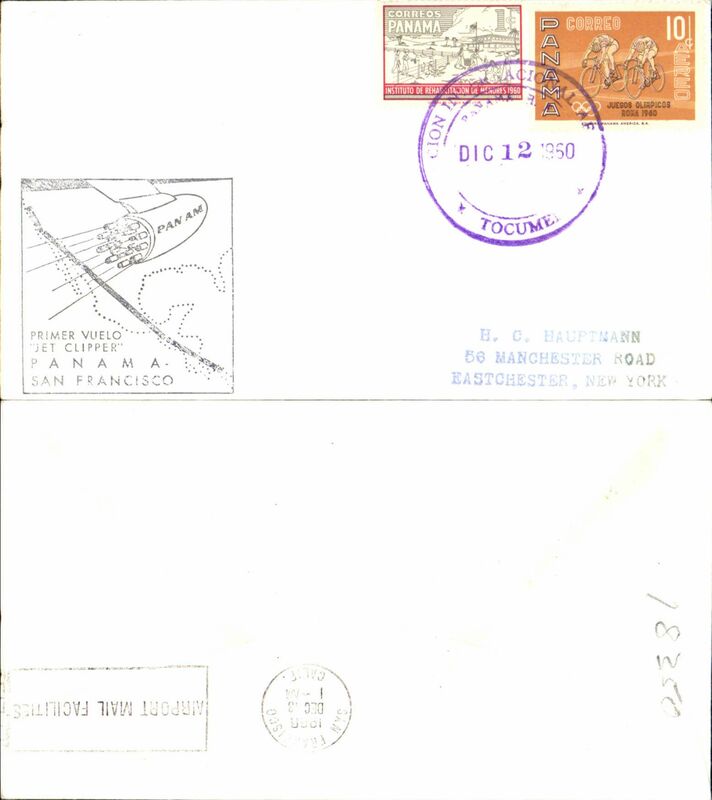 Panama to Lock Haven, b/s, franked FDI 2c redand 5c blue imperfs, issued to honor Lindbergh's arival in Panama, both stamps cancelled with special red commemorative cachet. 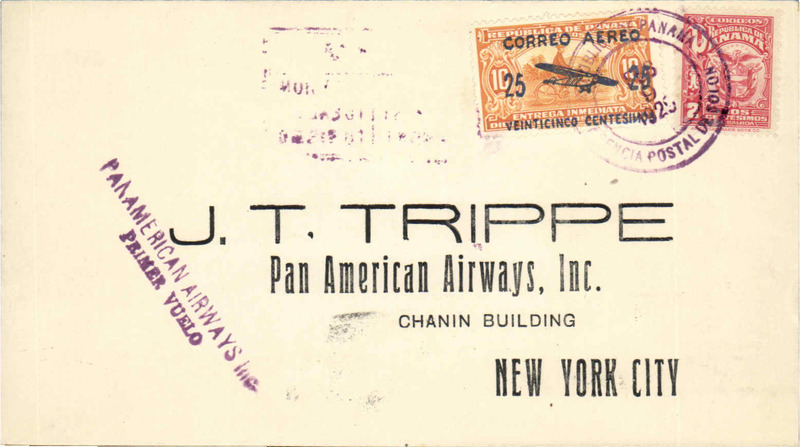 Inaugural FAM 5, Colon to Miami, franked 2c National + 25c air,canc Agencia Postal Colon cds, bs New York 15/2, violet two line 'Panamerican Airways Inc/Primer Vuelo' flight cachet, printed cover addressed to JT Trippe, Pan Am AW Inc, New York. 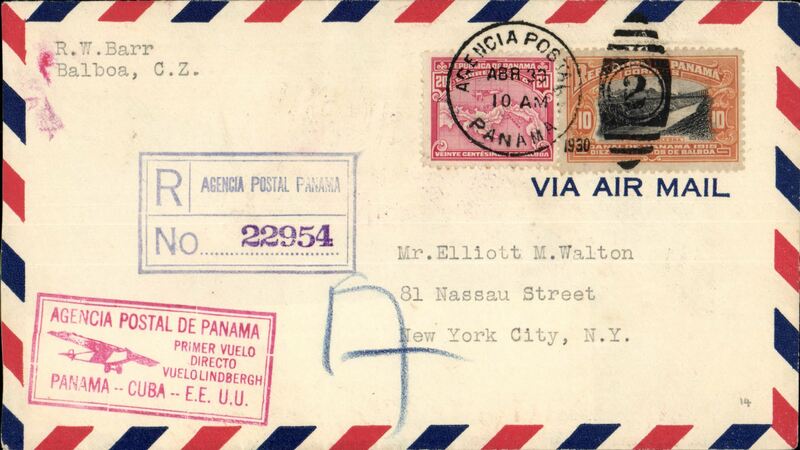 Because USPOD had not authorised Panama mail it was neither backstamped at Miami, nor forwarded from there by domestic airmail. This notwithstanding, such mail is an imprtant part of FAM 5's inaugural history. 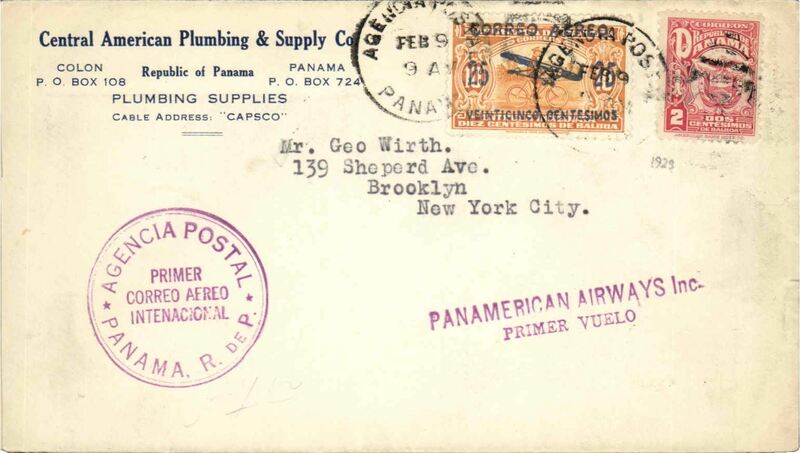 Inaugural FAM 5, Panama to Miami, 2c PSE with additional 25c air, canc Agencia Postal Panama cds, violet two line 'Panamerican Airways Inc/Primer Vuelo' and double ring F/F cachets,flight cachet. 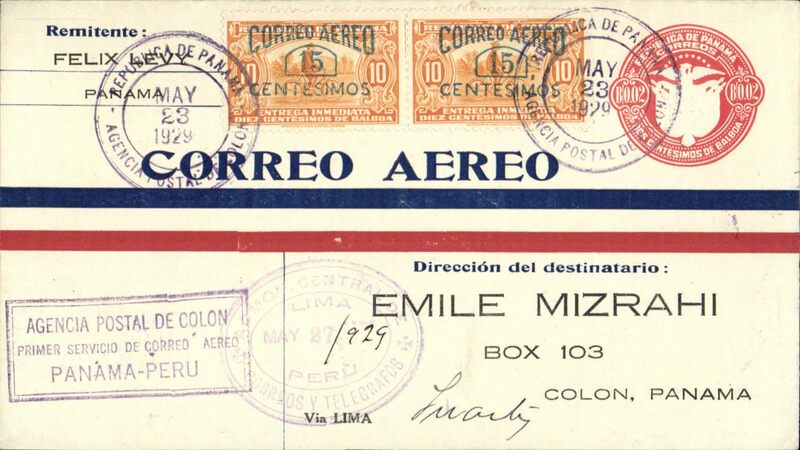 Because USPOD had not authorised Panama mail it was neither backstamped at Miami, nor forwarded from there by domestic airmail. This notwithstanding, such mail is an important part of FAM 5's inaugural history. 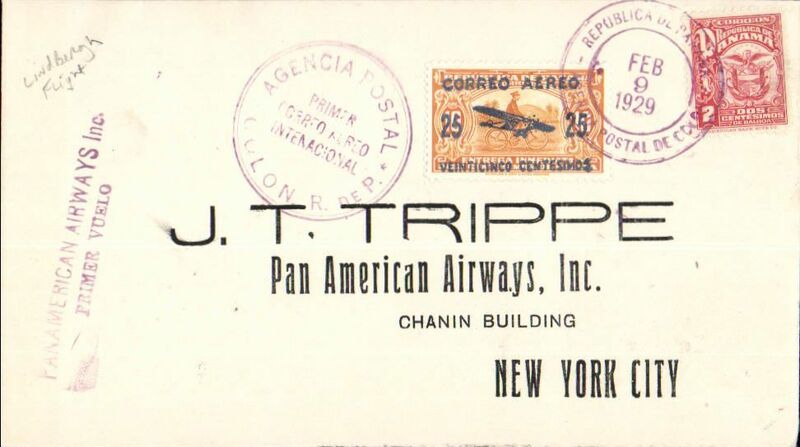 Inaugural FAM 5, Colon to Miami, franked 2c National + 25c air,canc Agencia Postal Colon cds, bs New York 15/2, violet two line 'Panamerican Airways Inc/Primer Vuelo' flight cachet, printed cover addressed to JT Trippe, Pan Am AW Inc, New York. 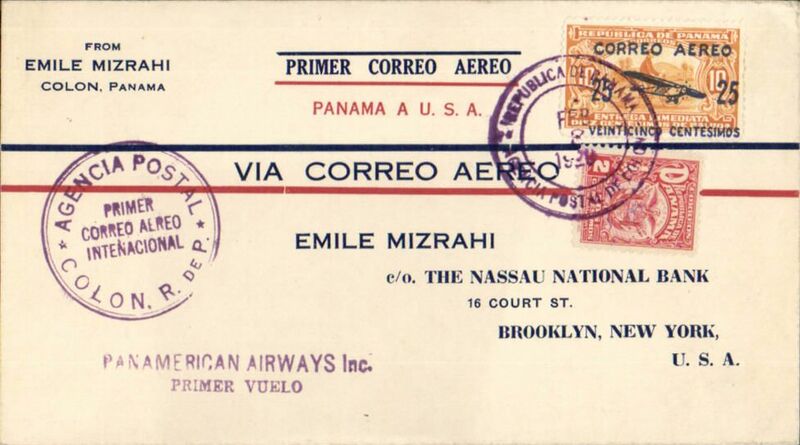 Because USPOD had not authorised Panama mail it was neither backstamped at Miami, nor forwarded from there by domestic airmail. This notwithstanding, such mail is an important part of FAM 5's inaugural history. 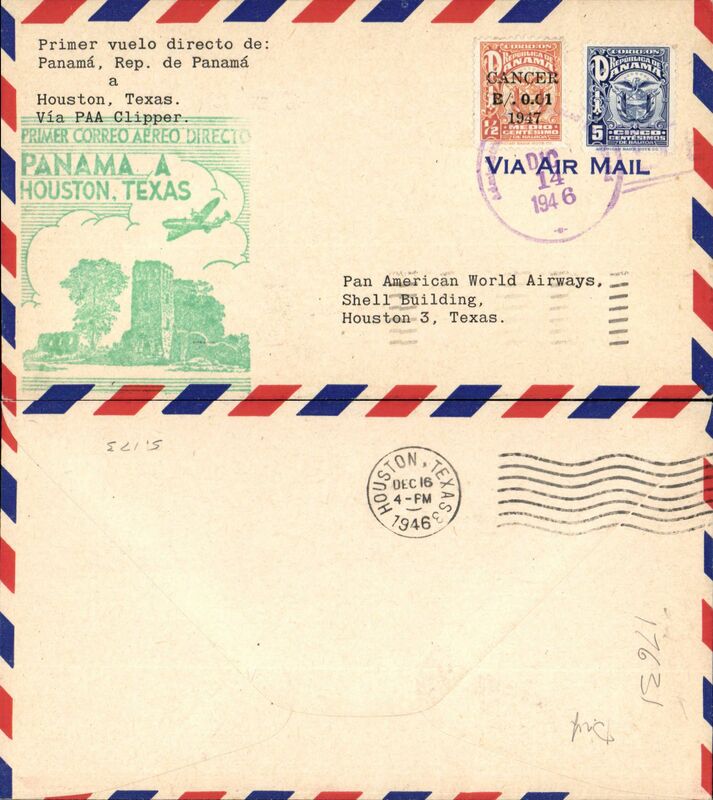 Inaugural FAM 5, Panama to Miami, franked 2c National + 25c air opt, canc Agencia Postal Panama cds, violet two line 'Pan-American Airways Inc/Primer Vuelo' and double ring F/F cachets. 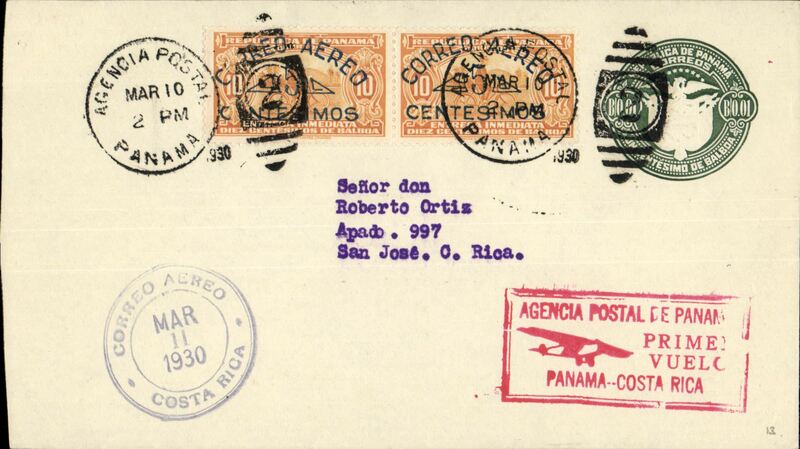 Because USPOD had not authorised Panama mail it was neither back stamped at Miami, nor forwarded from there by domestic airmail. This notwithstanding, such mail is an important part of FAM 5's inaugural history. 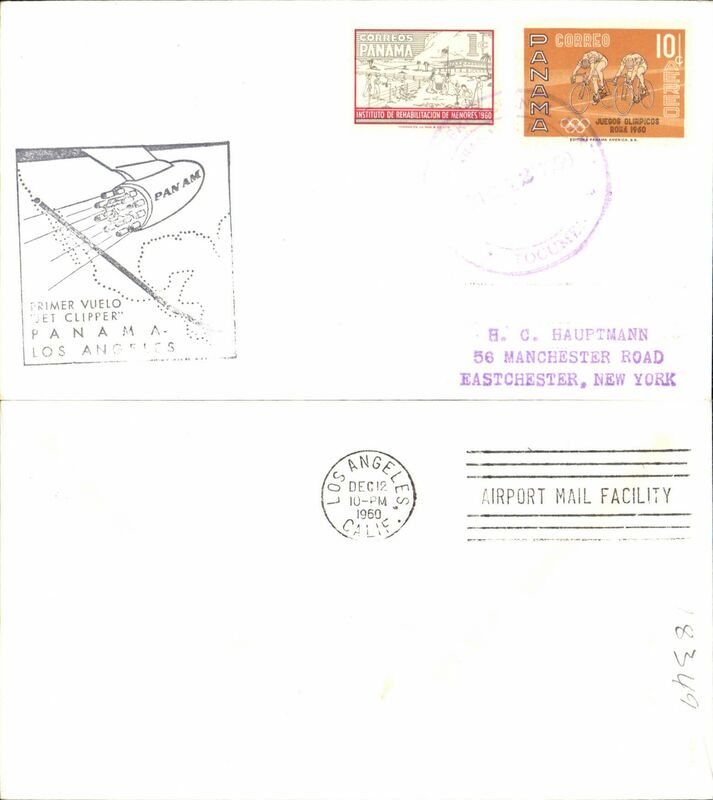 Inaugural FAM 5, Panama to Miami, franked 2c National + 25c air,canc Agencia Postal Panama cds, violet two line 'Panamerican Airways Inc/Primer Vuelo' and double ring F/F cachets,flight cachet. 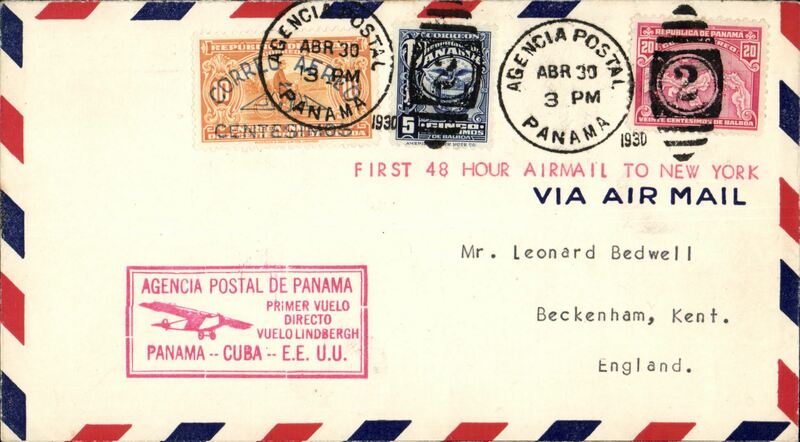 Because USPOD had not authorised Panama mail it was neither backstamped at Miami, nor forwarded from there by domestic airmail. This notwithstanding, such mail is an imprtant part of FAM 5's inaugural history. 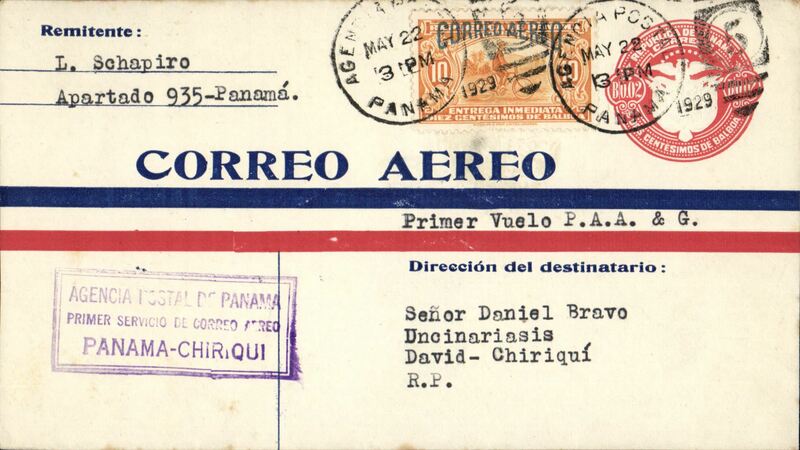 F/F FAM 5, Colon to David, 2c red Airmail Postal Stationary Envelope franked additional 10c orange air, violet rectangular "Panama-Chiriqui" flight cachet, David receiver ds verso. Small mail. 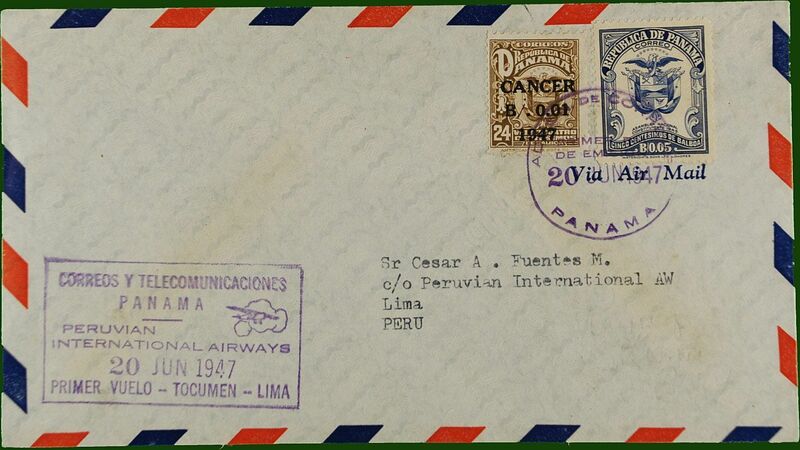 PANAGRA F/F Colon to Lima (Peru), bs 27/5, plain cover franked 32c canc 'Republica de Panama/Agencia Postal de Colon' double ring cds, purple framed 'Panama-Peru' flight cachet. 162 pieces carried from Colon. Signed by the pilot Frank E. Ormsbee. 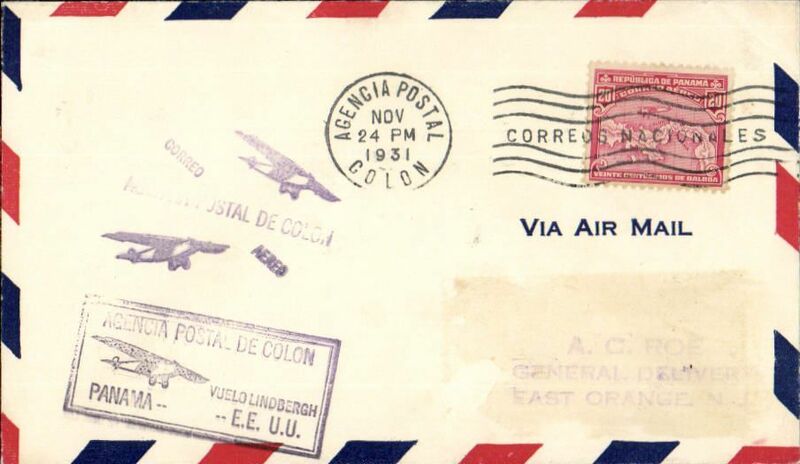 PANAGRA F/F Colon to Guayaquil (Ecuador), bs25/5, plain cover franked 12c canc Colon double ring cds, purple framed 'Panama-Ecuador' flight cachet. Only 73 pieces carried. 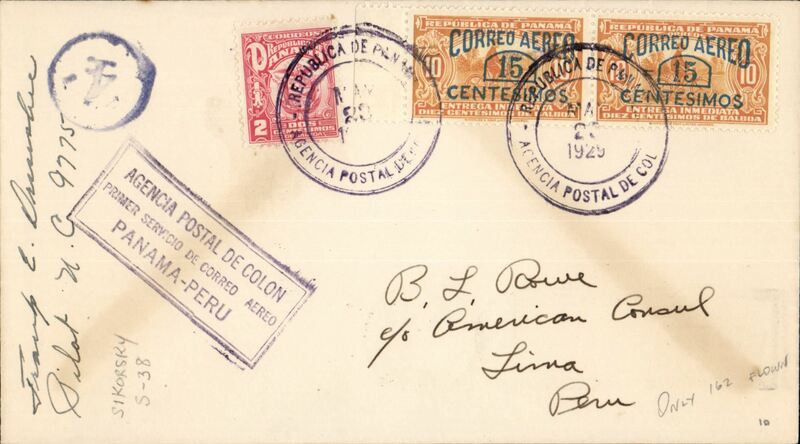 PANAGRA F/F Colon to Lima (Peru), bs 27/5, red/cream 2c PSE with additional 20c, canc 'Republica de Panama/Agencia Postal de Colon' double ring cds, purple framed 'Panama-Peru' flight cachet. 162 pieces carried from Colon. 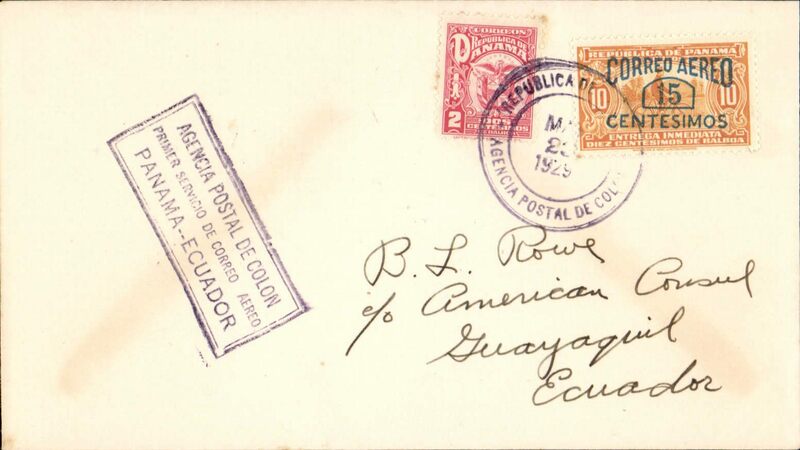 PANAGRA F/F Panama City to Guayaquil (Ecuador), bs 25/5, red/cream 2c PSE with additional 25c, magenta framed 'Panama-Ecuador flight cachet. 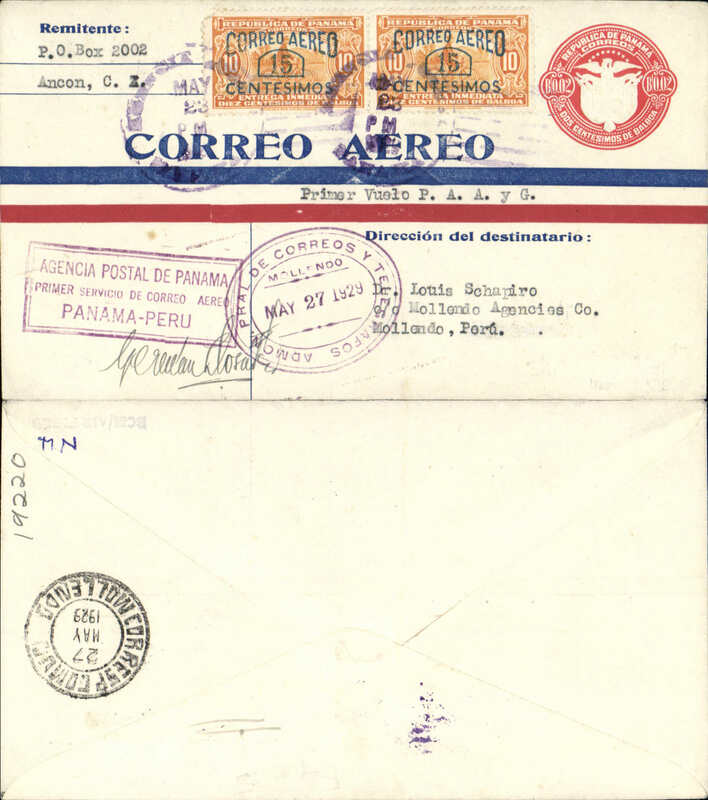 PANAGRA F/F Panama City to Mollendo (Peru), bs 27/5, red/cream 2c PSE with additional 20c, magenta framed 'Panama-Peru flight cachet. 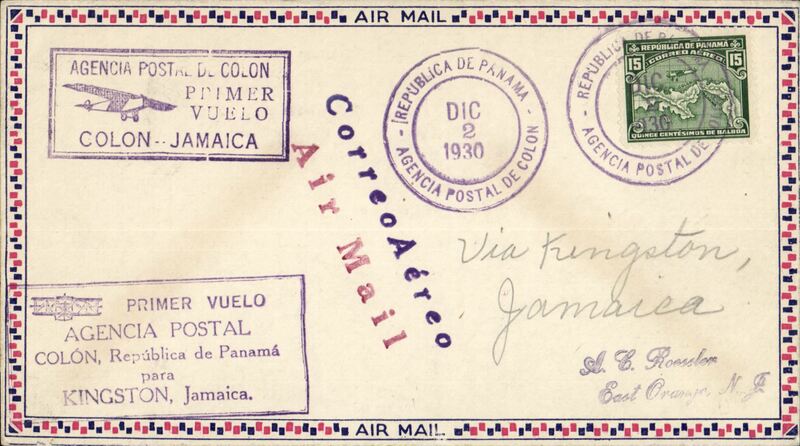 F/F FAM 5, Colon to Curacao, bs 10/7, boxed purple first flight cachet," Correo Aereo" hs, b/s, air cover, Pan Am. 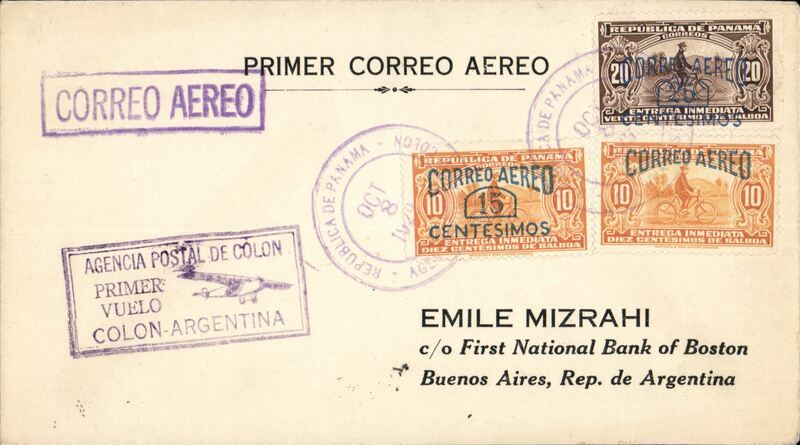 F/F FAM 9 Colon to Buenos Aires, "Colon-Argentina" cachet, b/s 19/10 and flown on to Asuncion, b/s 20/10, violet boxed "Correo Aereo" hs, Mizrah cover, Pan Am, uncommon. 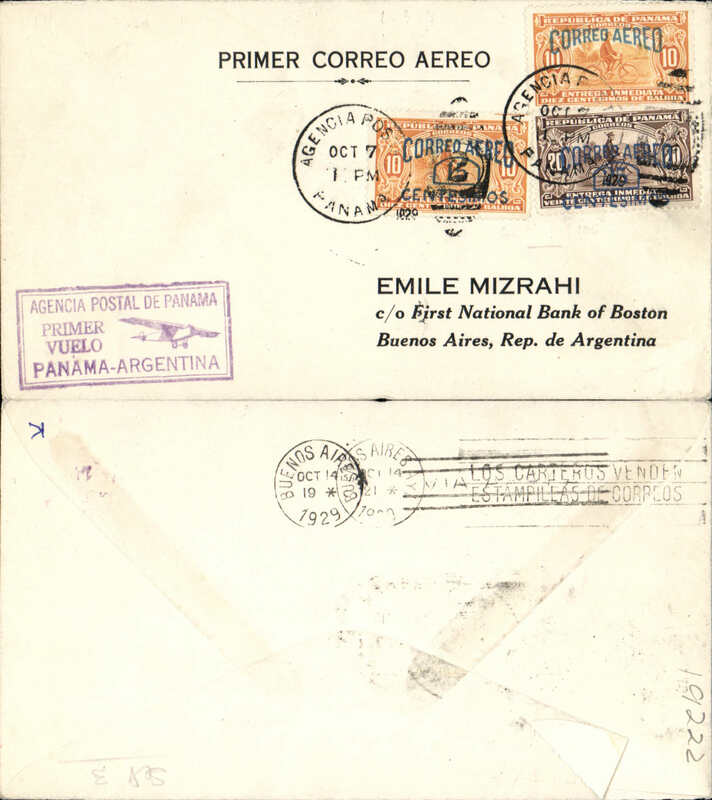 Pan Am/PANAGRA F/F Panama City to Buenos Aires, bs 14/10, black/white Mizrah ,Primer Correo Aereo' cover franked 50 c, violet framed 'Panama-Argentina' flight cachet. 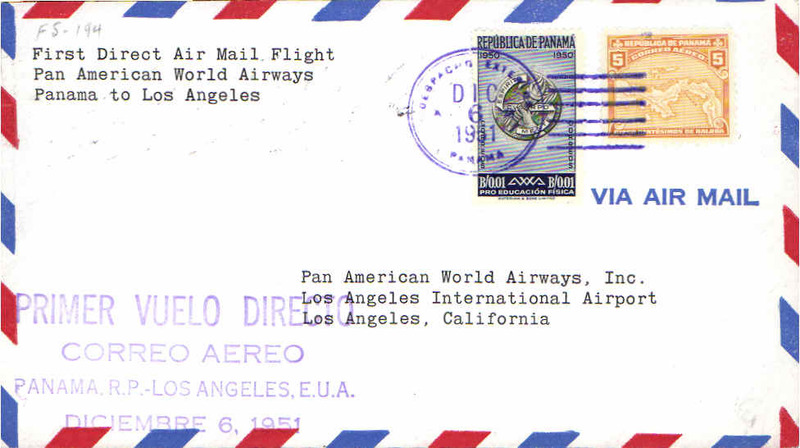 Flown Pan Am to Cristobal, then Panagra to BA. 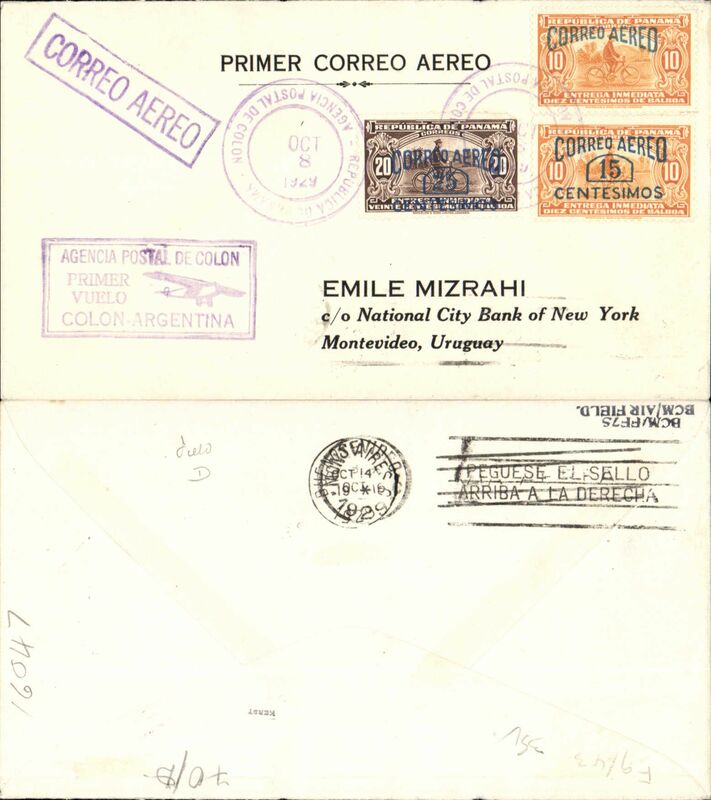 Pan Am F/F FAM 9 Colon to Buenos Aires, "Colon-Argentina" cachet, b/s 19/10, violet boxed "Correo Aereo" hs, Mizrah cover, uncommon. Francis Field authentication hs verso. 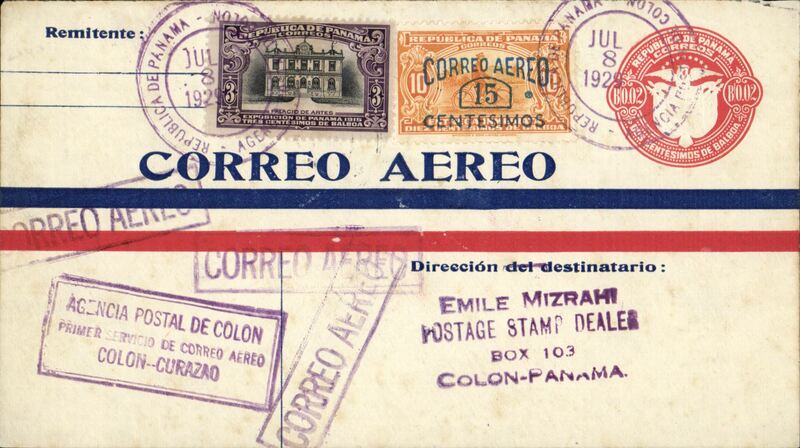 F/F FAM 8, Panama City to San Salvador, violet flight cachet and "Par Avion" hs, b/s, Mizrah cover, Pan Am. 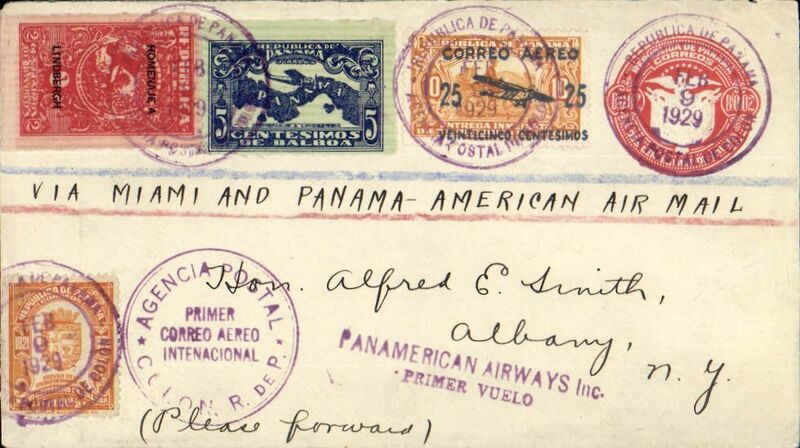 F/F FAM 5 Panama City to San Jose (Costa Rica), PSE .01B (H7G 12) with additional 2x5c airs, red boxed "Panama to Costa Rica" cachet, Mar 11 arrival cds on front, Pan Am, 46 flown. 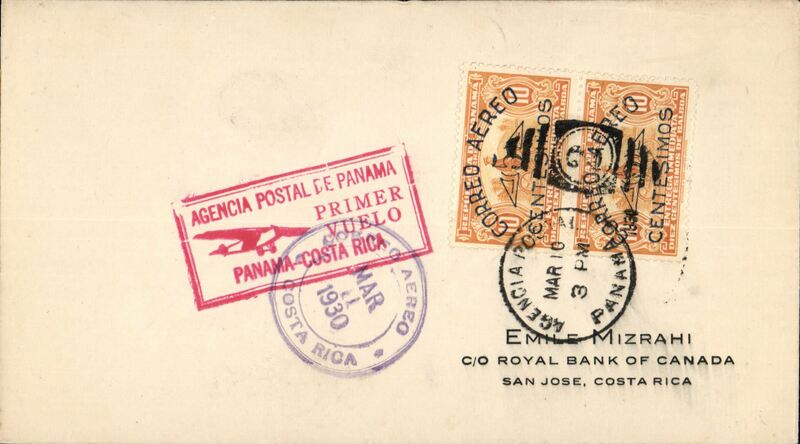 F/F FAM 5 Panama City to San Jose (Costa Rica), PSE .01B (H7G 12) with additional 2x10c airs, red boxed "Panama to Costa Rica" cachet, b/s, Pan Am, 46 flown. 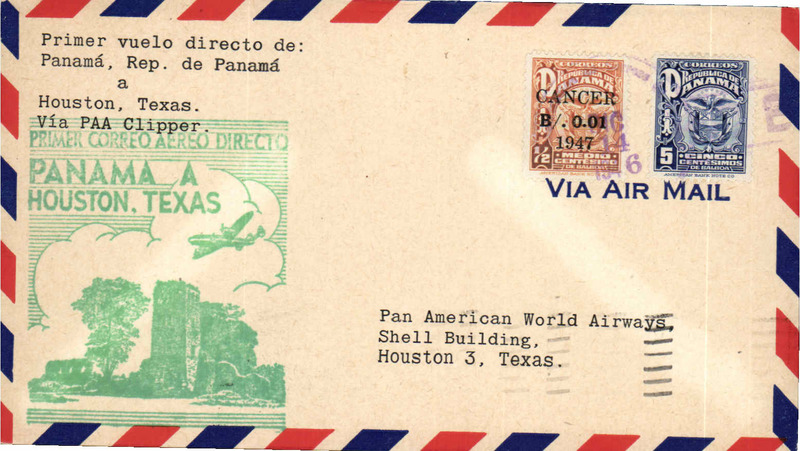 Pan Am FAM 5 first 48 hour airmail to New York, F/F Panama City to Miami, bs 2/5, red flight cachet 'Primer Vuelp/Directo/Vuelo Lindenbergh/Panama-Cuba-E.E.U.U. ', modified to incorporate a tribute to Lindbergh, pilots Lindbergh and Basil Rowe. Only 8 flown. F/F FAM 5, Colon to Jamaica, bs Kingston Dec 3, two violet framed 'Primer Vuelo 'Colon-Jamaica' and 'Colon-Kingston' first flight cachets. 50 flown. 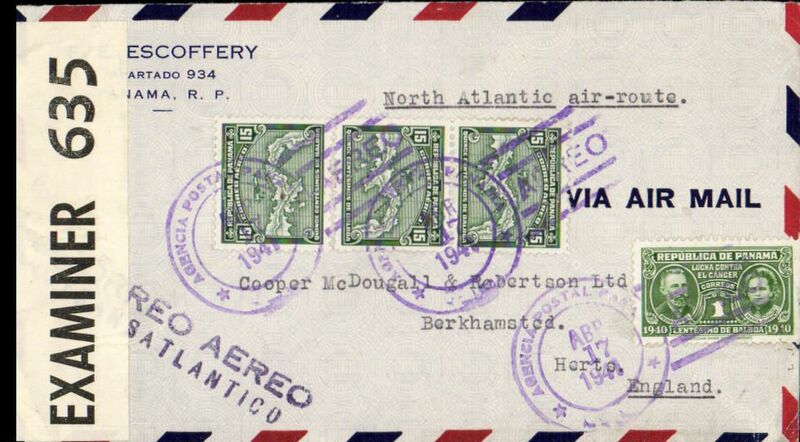 Lindbergh crash F/F American Clipper, unlisted dispatch from Panama City to Miami via Cristobal 25/11 transit cds, and on to Lancaster, PA 28/11, flown by Lindbergh from Cristobal to Miami on the inaugural mail flight of the American Clipper, airmail cover franked 20c, large green boxed cachet "First Flight/The American Clipper/Canal Zone-USA/Nov 25, 1931", Pan Am. The flight was interrupted during take-off (AAMC 31.12A). 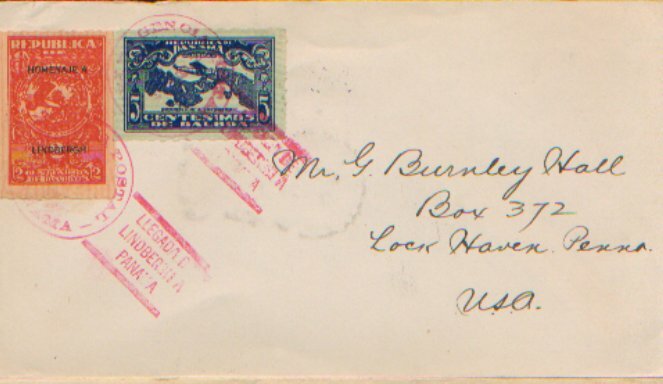 Bears postmaster's signature. Superb item, ex Krupnik. 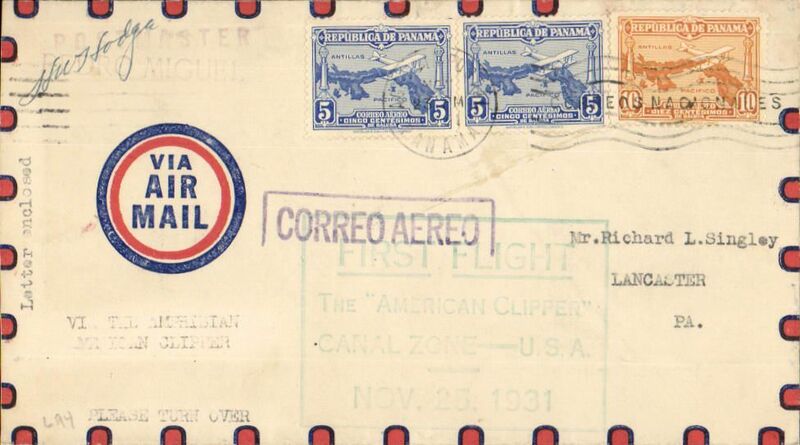 Lindbergh crash F/F American Clipper, unlisted dispatch from Colon to Miami via Cristobal and on to New Jersey, flown by Lindbergh from Cristobal to Miami on the inaugural mail flight of the American Clipper , airmail cover franked 20c, black framed "Agencia de Colon/Vuelo de Lindbergh/Panama-EEUU" flight cachet, Pan Am. The flight was interrupted during take-off (AAMC 31.12A). Nice item, ex Krupnik. 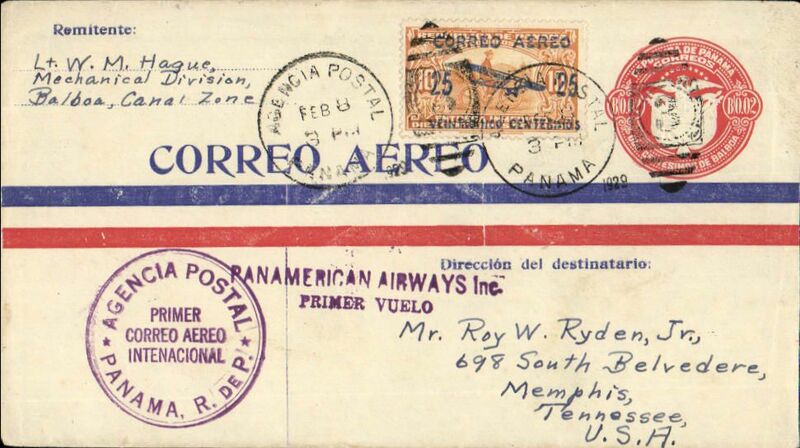 World War II censored airmail cover, Panama to England, no arrival ds, airmail cover franked 46c, canc Panama/Aero/ Abr 17 1941 machine postmark, black two line "Correo Aereo/Transatlantico" hs, sealed OBE 635 Carribean censor tape. 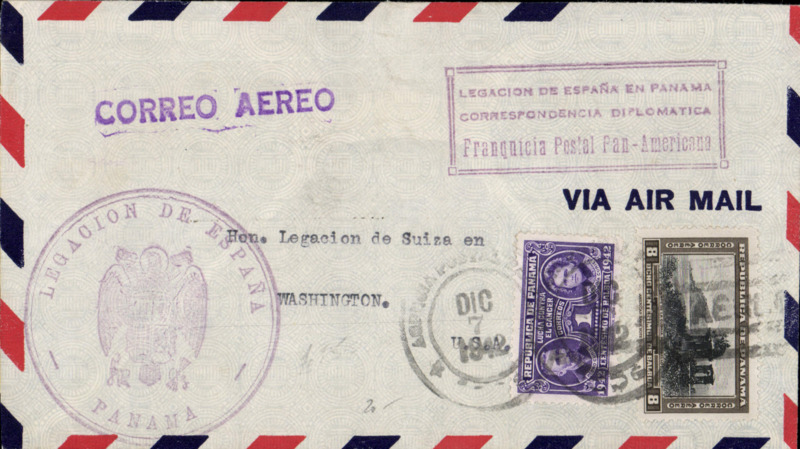 WWII diplomatic airmail, Panama to Washngton, no arrival ds, airmail cover franked 9c (airmail surcharge), fine violet framed "Free Postage Pan American" (in Spanish), large 'Legation de Espana/Panama' hs's front and back, violet 'Correo Aereo' hs. 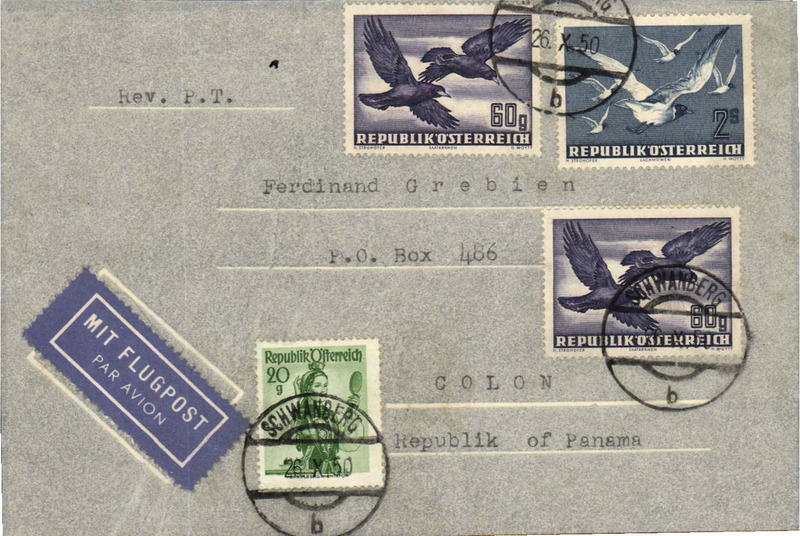 Incoming flown cover, Vienna to Panama, bs Colon 30/10, franked 340g inc 2S&60gx2 1950 airs. Uncommon destination. 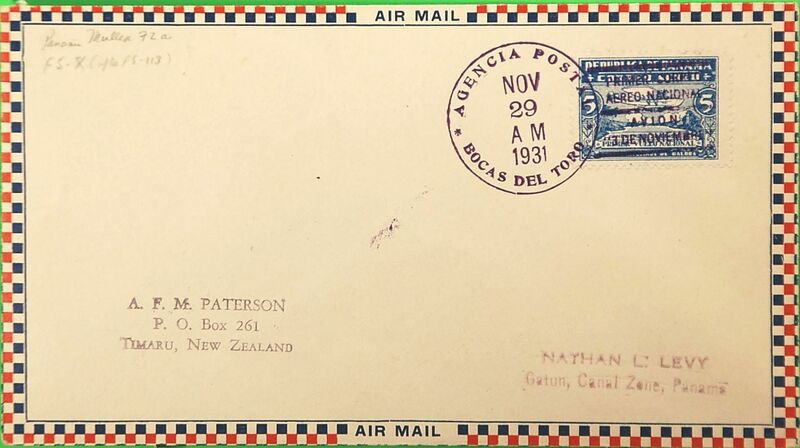 Panagra DC8 F/F Tocumen-Miami, airmail cover, flight cachet, b/s.